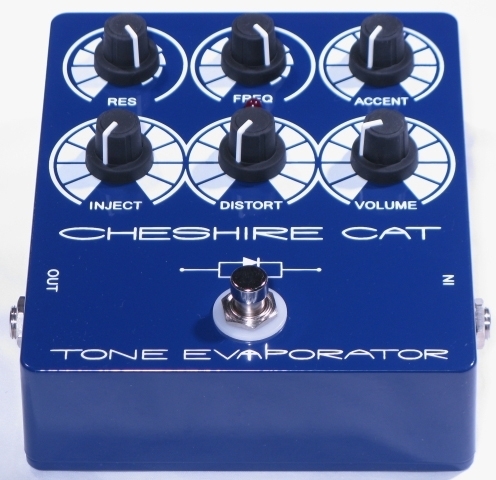 The Cheshire Cat puts you in charge of your distortion sound like never before. This is not a conventional distortion, fuzz or overdrive pedal. The patent-pending, all-analog design allows for a wide range of innovative adjustments. Get more out of your guitar! You can use the high quality filter to adjust the frequency and resonance characteristics of the distortion - without affecting the musical tone. Fine tune the attack and sustain response with the unique accent knob. Go mad or stay cool with the injection level. There's also a coventional distortion control, and a handy volume knob that comes with a little extra kick should you need it. For every application, the Cheshire Cat is a versatile and professional musical accessory that puts artistic sound control where it belongs: in the hands of the creative musician. Adjusts the distortion level from near clean to extreme crunch. Increasing the injector increases the distortion and activates the Res, Freq and Accent controls. Permits adjustment of the attack and sustain response. 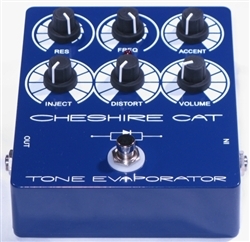 Adjusts the frequency characteristics of the distortion effect over a wide range, without affecting the tone of your instrument. Works with the Freq control to adjust the effect from ultra-mellow to ultra-sharp. Adjusts the output volume from zero. Provides a slight gain boost when set at maximum.